Helena Augusta or Helena Constantinople is the mother of the Emperor Constantine the Great. In 325 AD, Helena made her way to the Holy Land to recover relics from Christ’s tomb. When she arrived in Jerusalem, she ordered the Venus temple built over Christ’s tomb near Calvary to be torn down. She then ordered the site to be excavated and discovered what became to be known as the ‘True Cross’ of Christ. Although all three crosses of the crucifixions at Calvary were recovered, it was allegedly a dying woman who touched the ‘True Cross’ and miraculously recovered. By this act, she identified the ‘True Cross’ from these three crosses. After the recovery of the ‘True Cross’ Helena built the ‘Church of Holy Sepulchre’ at the burial place of Christ at the orders of her son Constantine the Great. The consecration date of the ‘Church of Holy Sepulchre’ was 13 September 335 AD. This day is still celebrated in Christian traditions and is called the day of the ‘Exaltation of the Holy Cross’. While the dedication of the Church was held on September 13th, the ‘True Cross’ was brought outside the church on the following day on September 14th for public display and veneration. Most interestingly the celebration date of the Roman Goddess Juno displayed at the Four Fountains in Rome is also the 13th of September. In addition Sixtus V re-erected the obelisk at St Peter’s Square on the day of the ‘Exaltation of the Cross’ in 1586. This symbolic day was surely chosen to dedicate the obelisk to the ‘True Cross’ which is not Christ’s cross, but the eight pointed cross depicted at St Peter’s Square. Until 1969 in the Catholic Church, the four Ember days of the liturgical calendar were celebrated. The Ember days were spaced roughly equidistant in the calendar year and meant three days of fasting. One of these fasting days was in the week after the Holy Cross Day of September 14th. These four fasting periods therefore represent a four-pointed cross in the liturgical calendar. And this is where the association with the esoteric meaning of the ‘True Cross’ begins. One can be sure that in 325 AD, Helena did not recover the cross of the crucifixion since this cross was allegedly found buried near Christ’s tomb. It’s hardly conceivable that a wooden cross that has been buried for three centuries could be preserved in good condition. It’s therefore far more reasonable to suspect that Helena discovered Christ’s esoteric ‘True Cross’. While the allegedly recovered remains of the cross of Jesus’ crucifixion were presented to the public as the exoteric ‘True Cross’, the esoteric ‘True Cross’ was what was most likely really discovered by Helena in Jerusalem. A nun named Egeria described the veneration of the True Cross in Jerusalem in 380 AD, and she explained how the Holy Cross was kissed by congregations in ceremonials. During these ceremonials a deacon held the ring of King Solomon. The bishop of Genoa, Jacopa de Voragine wrote the ‘Golden Legend’. In the ‘Golden Legend’ the True Cross originated from the seed of the Tree of Life in the Garden of Eden. This seed was eaten by Adam and after Adam’s death and burial a tree started to grow from this seed. This tree was eventually cut and used to build a bridge for Queen Sheba on her voyage to meet King Solomon. She told Solomon about the exceptional quality of the timber of the bridge and Solomon preserved the timber to become the timber of the ‘True Cross’ for the crucifixion of Christ 14 centuries later. These legends connect the ‘True Cross’ with King Solomon and we can only surmise that the ‘True Cross’ is the Key of Solomon’s, the eight-pointed cross! The day of the consecration of the Holy Sepulchre in 335 AD was not just an ordinary date. It had an astronomical significance. The date of the consecration in the Julian calendar was 14th September which is 15th September in the Gregorian calendar. 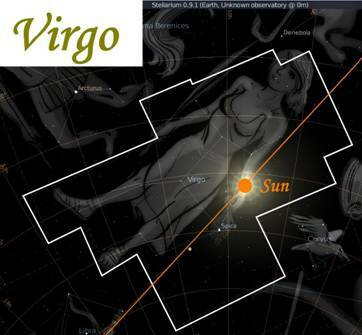 On the 14th of September 335 AD, the Sun resided at the center of the constellation Virgo. Virgo is the constellation of the virgin and is symbolically referring to Mary, the mother of Jesus. The constellation Pisces, on the other hand, is associated with Christ. Christ was a fisherman, and the Vesica Pisces is the universal symbol of Christianity. 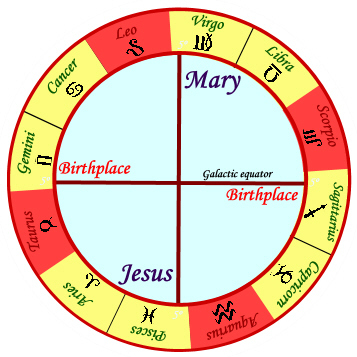 The inauguration date of the Church of the Holy Sepulchre may therefore esoterically be referring to the Galactic Cross that connects the signs Virgo and Pisces with the birthplaces of the Sun, the Silver and the Golden Gate on the Galactic Equator. 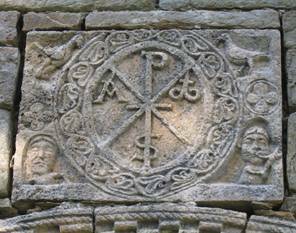 It comes, therefore, as no surprise that the Chi-Rho cross that Constantine the Great saw in his vision is a cross that is sometimes depicted as an eight-pointed cross. The letters Alpha and Omega in the Labarum in reality correspond with the alpha and omega of the precession cycle, the moment of the Great Celestial Conjunction around 2012 when one precession cycle ends and another starts. While the alpha and omega in Christianity exoterically refer to Christ’s birth and Second Coming; esoterically it is referring to the end and start of the precession cycle. 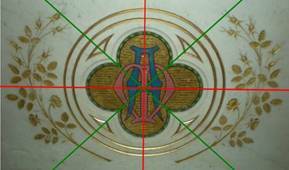 The combination of the eight-pointed cross with the alpha and omega can still be found in Catholic churches today. We can be sure that the Chi-Rho is related to our Sun and NOT to a ‘mystery star’ as Herschel suggests, since the Chi-Rho appeared to Constantine in his vision next to the Sun! Chi-Rho in eight-pointed cross form. Christian Alpha and Omega forming an eight-pointed cross form. Constantine the Great was the first Roman emperor to be converted to Christianity. In his time, the Roman pagan Sun worshipping religion of Mithraism was slowly surpassed by Christianity and his mother Helena converted Constantine to Christianity. It seems that both Constantine and his mother Helena were fully aware of the Egyptian significance of the ‘True Cross’, not the one that Jesus but that Horus died on in the precession cycle. Being converted to Christianity, Constantine’s mission was to eradicate the true roots of Christianity. He made great strides in this respect at the First Council of Nicaea in 325 AD where the first dogmas and creeds of the church were defined. This was technically the event where Christianity in its modern form was designed, all of the canonical books were selected and the pagan Egyptian roots were eradicated. But the ‘True Cross’ was and has never been fully eradicated from Christianity. It survived until this very day in its esoteric form and for those with eyes to see and ears to hear the time of the Revealing, ‘Revelations’ is here to lift the veal of Christianity and reveal what has been hidden under a small layer of veneer for centuries. This is the true Da Vinci Code revealing the deceptions of Christianity. We may only hope and pray that this is what Dan Brown will also be revealing in his next novel titled ‘the Key of Solomon’.